Upon hearing that a Hawaiian restaurant has opened up in the ultra-foodie district of Tai Kok Tsui, we were excited to check out whether this sizeable eatery has indeed brought a bit of that tropical paradise to this part of the world. Kona Bay is decked out well enough, but lacks any Polynesian or Hawaiian punch. It’s not that we’re looking for anything exceptionally gimmicky, but a coconut or some tropical palm leaves here or there would have added to the fun. 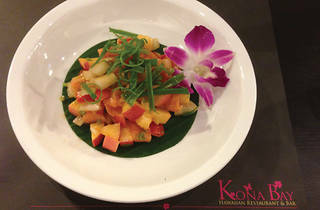 Kona Bay’s menu also come off more like an upscale cha chaang teng. A mild Hawaiian feel sprouts up in some choices like the tuna poke appetizer ($68), mixed with apple chunks, cilantro and soaked in soy sauce and sesame oil. The sashimi dish is refreshing, with generous slivers of tuna, but comes off too sweet and lacking finesse. Mains like the tonkatsu loco moco ($68) needs tweaking, as the pork cut is dry and the sauce more sweet than the savoury gravy we are normally accustomed to pairing our loco mocos with. 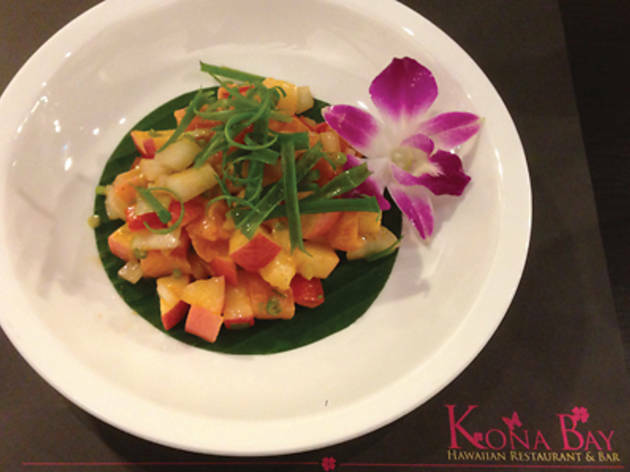 We order the haupia (coconut) squares ($18), nice and light, and well suited for the Cantonese palate. Kona Bay G/F, 17 Chung Wui St, Tai Kok Tsui, 2392 8100. Daily midday-11pm. Dinner for two: around $200.